So I am a tiny bit burned out on Waiting on Wednesday. Not that there are not a ton of books that I am waiting on but my list grows bigger and bigger and I grow ever more depressed at the size of it. So for now I am taking some intermittent breaks. 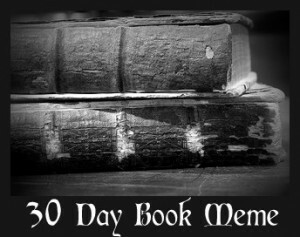 On the weeks I can’t bear to look at my ever growing TBR list, I am going to work through the 30 Day Book Meme. Well, no one ever said the 30 days had to be in a row, now did they? This one is hard because I read a number of good books last year. Let’s Pretend This Never Happened: A Mostly True Memoir, The Immortal Rules, The Fault in Our Stars, Daughter of Smoke & Bone, Chime and Graceling to list the ones I would consider for this. And really how do you pick between them? I could choose each one for a different reason. I am going to save TFiOS for another Day. I loved TIR and DoS&B for very much the same reasons so they cancel each other out. Chime was an audio book, does that count? Yes it does. Top Ten Tuesday: Take me Away!